City council met in special session Monday, October 1, 2018. The agenda indicates that they plan to discuss and take action on council’s legislative agenda with the state. That ought to ruffle some feathers at the school districts. 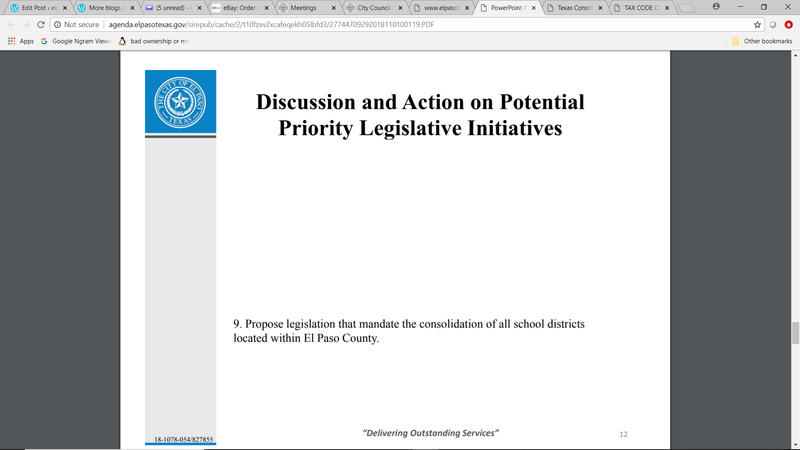 This entry was posted on Friday, October 5th, 2018 at 5:15 AM and is filed under City government, El Paso Independent School District, State Government. You can follow any responses to this entry through the RSS 2.0 feed. You can leave a response, or trackback from your own site. This has as much chance of happening as Kavanaugh divorcing his wife and marrying Ford on the steps of the Lincoln Memorial. If you live in the Ysleta Independent School District, you have an extra 20 percent homestead exemption. If YISD would be consolidated into one large city wide district, property taxpayers in that district would most likely lose that benefit. Those YISD property taxpayers are also likely voters, and could certainly raise hell in any upcoming mayor and council races, plus they also get to vote for local area state representatives and senator positions. A more reasonable option, might be to push for legislation that penalizes school districts, that force local property taxpayers to subsidize underutilized school campuses. As you likely know, El Paso now has three school districts with documented declining student enrollment. There are no easy answers, but asking the legislature to address some of these issues which drive up local property taxes, certainly merits public examination and discussion! School districts are entrenched supporters of ‘the status quo,’ so don’t look to them for solutions. Thank you OF, however I disagree with your point re entrenched in the status quo. YISD opposition has nothing to do with entrenched support of the status quo. YISD voters simply are not stupid. 1. YISD applied and received half of the $430 million bond from the State leaving taxpayers to cover only $215 million. EPISD refused, probably because they do not want the oversight or to honor the commitments they made to the voters. 2. YISD has successfully completed almost all the bond projects on time and under budget with a surplus of $35 million. 3. All but 2 of the YISD projects went to local businesses and NONE of those businesses included the “usual suspects” that get handouts from EPISD. 3. YISD lowered the property tax rate. The problem is across the board incompetence on EPISD’s Board, in their Administration,and involvement of the same “questionable influencers”. EPISD hired 3 of the worst former City Employees for financial, planning, and facilities management. Why would anyone expect competence from those 3???? Fortunately each ISD would have to vote separately to consent to consolidation. Considering how bad EPISD debt. management, and personnel problems are, no one in their right mind would vote for consolidation. Financial- OK that was CAC and you’re entirely correct. Planning? Facilities Management? There is no planning and management of facilities has been a running joke for 15 years. They don’t maintain or manage, they build new. And judging by how fast the plans change for the renovation, consolidation, etc they’ll run out of money long before they run out of projects. especially hiring new consultants to try to “one-up” what the previous consultants told them to do. I expect EPISD to collapse into insolvency, with classrooms running 45 – 50 students, new teachers in 2/3 of the classes, and no clear cut plan for students to achieve anything. The other district could consolidate and probably leave EPISD as the inner city district. ‘Good Governance Oxymoron:’ you brought up four good points, but no where did you address YISD’s ‘intractable’ declining student attendance problem! That problem was adequately detailed in that ‘demographic study’ which was done prior to the last bond election. And with all the money dumped into the rebuilding of Eastwood High School; has the district created one giant, mega, ‘show case’ high school, which will offer programs YISD’s other high school campuses will be unable to match? Has YISD created its own ‘unequal opportunity’ problem? As I recall from that Templeton Demographics Study, except for Eastwood High, all other YISD high schools are around 75 percent student attendance, with Riverside High at just below 50 percent. Great idea to force the closure of under utilized schools although we must realize EPISD tried to close several schools and it was the community who fought against it. So I agree to penalize districts with keeping under utilized schools but they should be allowed to pass that penalty on to the tax base who is fighting to keep the under utilized schools open. Maybe once they are given the option to have a lower tax rate with school closures versus a higher tax rate with keeping under utilized schools open the tax payer will then realize it is not financial sound to keep small, under utilized schools open. I think I hear the reason, but disagree. One mega-District doesn’t sound good to me. While it should have some cost efficiencies, one mega district limits choice for families and students. The combination of charters and more districts should provide some competition and ideally better quality. The only negative is if Cabrera and EPISD end up in charge of the consolidated system. Motives are always in question when EPISD is involved. It’s like the biggest ***hole in your neighborhood, the one with the most rundown property, suggesting that you form a homeowners’ association and make him the president. First thing that come to mind for me is that a whole lot of deadwood should suddenly be set adrift (not to mix analogies or anything). IMHO, the major problem with all local districts has long been that they are all top heavy with admin, and ‘lite’ in the classrooms, where it matters most. State law says that in any consolidation would mean the largest school district becomes the lead district. Actually that is the first thing they’ve done that makes good sense to me. Consolidating districts would save money and allow for better resource allocation giving the shifting age demographics we’ve been seeing. IIRC there was a judge during the school districts’ suit against the state who strongly encouraged consolidation. I’d like someone to lay out the pros and cons.